Russian rabbi; born at Gerolzhofen, near Würzburg, 1809; died at St. Petersburg Aug. 22, 1875. 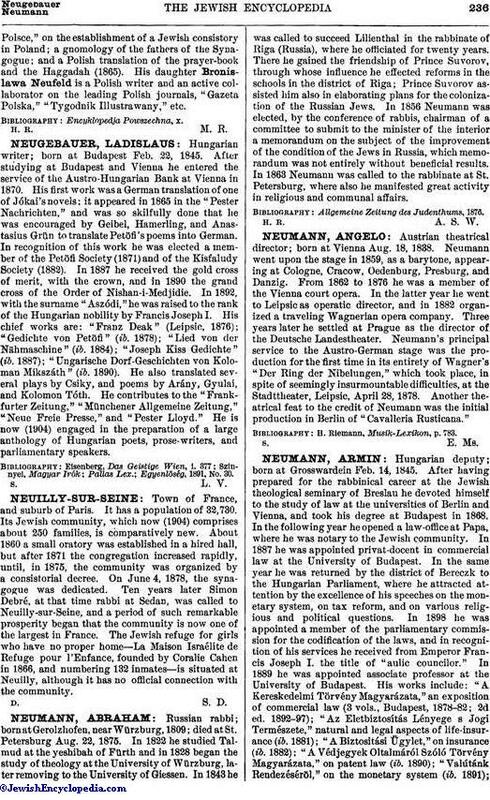 In 1822 he studied Talmud at the yeshibah of Fürth and in 1828 began the study of theology at the University of Würzburg, later removing to the University of Giessen. In 1843 he was called to succeed Lilienthal in the rabbinate of Riga (Russia), where he officiated for twenty years. There he gained the friendship of Prince Suvorov, through whose influence he effected reforms in the schools in the district of Riga; Prince Suvorov assisted him also in elaborating plans for the colonization of the Russian Jews. In 1856 Neumann was elected, by the conference of rabbis, chairman of a committee to submit to the minister of the interior a memorandum on the subject of the improvement of the condition of the Jews in Russia, which memorandum was not entirely without beneficial results. In 1863 Neumann was called to the rabbinate at St. Petersburg, where also he manifested great activity in religious and communal affairs. Allgemeine Zeitung des Judenthums, 1876.